As we approached the end of our internship with TIME, we had the opportunity to even further experience the customer service sector of the business. On Wednesday morning, Sumi informed us on one of the main levels of feedback that the company receives from their customers. Net Easy Score (NES) is a satisfaction survey that agents working in the Contact Centre send to customers via SMS after completing a customer service call. We learned that generally, every telecommunication company will have a standardised score like this, which they have to give to the governing body to ensure that they are operating at the right standard. The survey is sent using TIME’s user account management system called Ginger. The aim of the survey is to measure how easy the customers find it to interact and receive help from CS Agents. The SMS asks the client to rate the service on a scale of 1-10 (10 being good and 1 being bad) and then leave a brief reason for that particular score. In addition to this feedback, in order to improve TIME’s customer service system, the company chooses to contact all customers that rated the service 5 or below without providing a reason. I had the opportunity to speak with a client that was not satisfied with the particular CS Agent that they spoke to regarding his poor internet connectivity. This specific experience allowed me to gain first-hand involvement and further understand the process of CS and how it is significant in relation to keeping customers happy, thus preventing ‘churn’. We were all slightly nervous to attempt this type of call, due to the individual pressure entailed, however the majority of us felt that the calls were both positive and productive once completed. Later in the day, we were divided up into small groups to attend ‘Assurance Visits’ with third party contractors that specialise in service installation. The visits to customer living quarters were based purely around ‘faults’ that customers had noticed with their particular TIME Internet Package. Fortunately, I was able to join two visits which allowed me to gain an expanded degree of understanding. 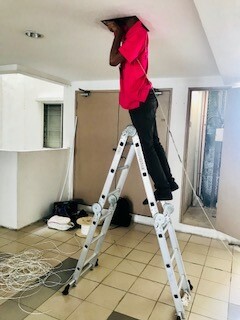 One issue regarded poor connection to the internet, which was quickly resolved by the replacement of the broken joint that was not allowing the fibre to connect efficiently. The second apartment had internet speed problems. This meant that while they were expecting 100Mbps, they were hardly receiving 50Mbps. On Thursday morning we each attended an actual Fibre Optic Broadband Installation at multiple locations throughout the city. These appointments lasted longer than those the previous day due to the higher complexity of the task. Upon arrival at the apartment, several necessary criteria were discussed: where the fibre would enter the building unit, how to minimise the quantity of visible cabling etc. The most intriguing part of this three-hour installation process was the cable pulling from the 8th floor, where the closest fibre splitter was located, to the 10th floor where the customer was situated. Witnessing this genuine scenario permitted me to enhance my technical exposure rather than solely focus on the business aspects of problems regarding installation. The afternoon was spent back at the office with Manimaran discussing the visits we had attended. During this time, we were able to verbalise our suggestions on how to improve the various aspects of Customer Service that we had observed. Our suggestions were genuinely absorbed by the CS Team, providing us with a sense of stimulus, contribution and appreciation. Friday was our final day at TIME Dotcom, so we all gathered at the office one last time to share our personal thoughts and response regarding the entire Internship Programme – all of which were very positive! 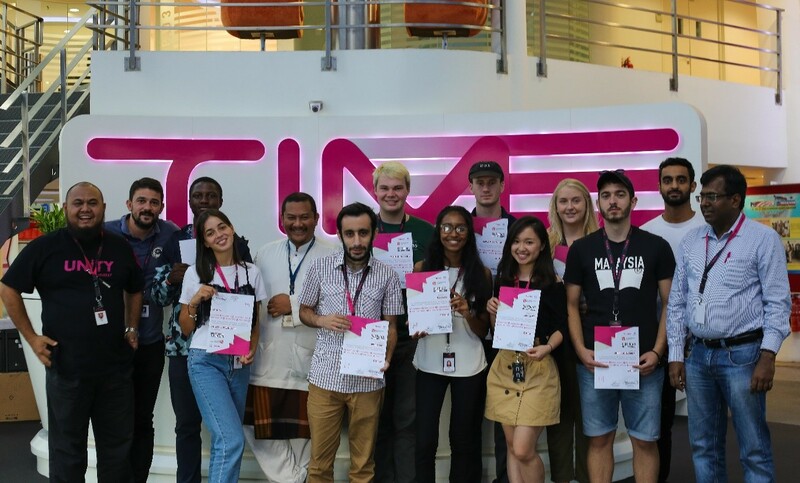 This meeting also allowed our group to express our immense gratitude to the TIME team, as well as the Sussex faculty members that accompanied us to Malaysia, for everything they had done to make this incredible opportunity possible. I think I can speak for all of the Sussex students on this internship when I say that the passion, consideration and hospitality of the entire company was like no other that we have ever experienced. This resulted in the trip being so much more enjoyable, educational and beneficial to us all. As a final goodbye we were all presented with certificates that they felt we had both individually and cooperatively earned throughout the four weeks with TIME! Students receive their certificates of completion after finishing their internship at TIME.